17.4Mohammed Siraj to Hardik Pandya. 1 run, Good length ball around off, Hardik flat bats it to long off and takes a single. 17.4Mohammed Siraj to Hardik Pandya. wide, 1 run, WIDE. This one is wided. Full and well outside off, let through again. 17.3Mohammed Siraj to Hardik Pandya. no run, Full and wide outside off, comes in late, grazing the wide line outside off, left alone. Lucky, is the bowler, that it is not wided. 17.2Mohammed Siraj to Hardik Pandya. FOUR, FOUR! Easy peasy for Hardik. A short ball, outside off, Hardik smashes it over the bowler. One bounce and into the fence. 17.1Mohammed Siraj to Krunal Pandya. 1 run, MISFIELD FROM KOHLI! And he is furious with himself. Full and outside off, Krunal punches it towards mid off and takes Kohli on. The skipper is ready to pick up and throw but fumbles at the last moment. Kicks the ball away in disgust. Mohammed Siraj returns. 1-0-12-0 so far. End of over 17 ( 10 Runs )MI 141/4 Hardik Pandya* 10(6)Krunal Pandya 10(19) 16.6Navdeep Saini to Hardik Pandya. FOUR, DROPPED AND FOUR! Has Southee dropped the match here? Full length ball outside off, Hardik looks to heave it over mid off. He mistimes it and the ball goes high in the air. Tim Southee runs behind and looks to catch it with a dive. He gets his hand to it but cannot hold onto it. The ball then goes on the ropes. 16.5Navdeep Saini to Krunal Pandya. 1 run, Good length ball outside off, Krunal punches it on the off side for a single. 16.4Navdeep Saini to Hardik Pandya. 1 run, Good length delivery on off, Hardik moves across and flicks it to square leg for a single. 16.3Navdeep Saini to Hardik Pandya. no run, Shorter in length, Hardik looks to pull but once again misses it. 16.2Navdeep Saini to Hardik Pandya. no run, Back of length ball outside off, Hardik looks to hit it over the bowler but misses. 16.1Navdeep Saini to Hardik Pandya. FOUR, FOUR! Not the way Saini would have liked to start the over. But definitely the way Mumbai wanted to start. Back of a length ball outside off, Hardik slaps it away over point for a boundary. The umpire goes upstairs to see whether the ball bounced before or on the ropes. Replays show that it was just inside the rope and the umpire signals it as a boundary. Navdeep Saini is back on. 2-0-24-0 so far. End of over 16 ( 4 Runs )MI 131/4 Hardik Pandya* 1(1)Krunal Pandya 9(18) 15.6Yuzvendra Chahal to Hardik Pandya. 1 run, Short again from Chahal, Hardik pulls it away and gets off the mark. Chahal finishes with the figures of 4-0-27-2. He is once again amongst the wickets. 15.5Yuzvendra Chahal to Krunal Pandya. 1 run, Tossed up on middle, Krunal sweeps it away for a single. 15.4Yuzvendra Chahal to Krunal Pandya. no run, Short outsie off, Krunal Pandya looks to cut but misses. STRATEGIC BREAK. Are we in for a thriller? Mumbai were cruising through but some quiet overs have pushed the required run rate above 9.5. Not that it is a concern for Mumbai but the last 27 balls have yielded just 21 runs and a wicket. Probably, the wicket of Surya could be a blessing in disguise for the home side as Hardik Pandya has come out to bat. There is Pollard in the shed as well. 15.3Yuzvendra Chahal to Suryakumar Yadav. out, OUT! Suryakumar Yadav holes out. Chahal with the breakthrough. Bangalore needed wicket and they have got it. They have not given Mumbai easy runs and the pressure has got to Suryakumar Yadav. Flighted delivery on off, Suryakumar Yadav tries to take the charge and go downtown. He gets a lot of height on it but it goes wide of long off. Navdeep Saini there settles under it and takes a very good catch in front of the ropes. 43 needed off 27 deliveries now. 15.2Yuzvendra Chahal to Suryakumar Yadav. 2 runs, Short again on leg, Suryakumar Yadav gets on his back foot and lofts it wide of deep mid-wicket. Virat Kohli steams to the ball but cannot stop the second. 15.1Yuzvendra Chahal to Suryakumar Yadav. no run, Shorter on leg, Surykumar Yadav taps it back to the bowler. Yuzvendra Chahal to bowl out. End of over 15 ( 8 Runs )MI 127/3 Suryakumar Yadav* 27(20)Krunal Pandya 8(16) 14.6Pawan Negi to Suryakumar Yadav. 1 run, Full and around off, pushed down to long on for one more. 14.5Pawan Negi to Krunal Pandya. 1 run, Comes down the track and lofts it powerfully but straight to long off. Just a single. 14.4Pawan Negi to Krunal Pandya. no run, Short and outside off, pulled straight to short mid-wicket. A bit mistimed. 14.4Pawan Negi to Krunal Pandya. wide, 1 run, WIDE. Full and well outside off, Krunal lets it go. 14.3Pawan Negi to Suryakumar Yadav. 1 run, The batsman works it down the leg side. They pick up a single. 14.2Pawan Negi to Suryakumar Yadav. FOUR, FOUR! Poor bowling. A long hop, outside off, Surya goes back and cuts it behind point for a boundary! 14.1Pawan Negi to Suryakumar Yadav. no run, That massive turn! Too good. Short ball, around off, grips the surface, Yadav looks to pull but the ball spins away a mile and beats the bat. Pawan Negi is back on. 2-0-17-0 so far. End of over 14 ( 3 Runs )MI 119/3 Krunal Pandya* 7(14)Suryakumar Yadav 21(16) 13.6Moeen Ali to Krunal Pandya. no run, Tossed up on off, Pandya hits it straight to mid off. Dot to finish off the over. Just 3 off Moeen's last. He finishes off with the figures of 4-0-18-2. Brilliant spell from Moeen. 13.5Moeen Ali to Krunal Pandya. no run, On off and middle, Krunal blocks it off his front foot. 13.4Moeen Ali to Krunal Pandya. no run, Beautiful ball! Flighted outside off, the ball spins just a bit after pitching. Pandya looks to push it on the off side but it goes just past his outside edge. Parthiv goes up in appeal and so does the bowler. The umpire is not interested though. Virat Kohli, Moeen Ali and Parthiv Patel have a brief discussion about the review. They decide to go against it. It was a good decision not to take it upstairs as Snicko later on shows that the ball did not hit the bat. The bat just hit the pads. 13.3Moeen Ali to Suryakumar Yadav. 1 run, Shorter around off, Suryakumar Yadav runs it down to third man for a single. 13.2Moeen Ali to Krunal Pandya. 1 run, Floated on middle, Krunal comes down the track and uppishly drives it wide of diving Moeen Ali towards long off for a single. 13.1Moeen Ali to Suryakumar Yadav. 1 run, Shorter on off, Suryakumar Yadav milks it to long on for a single. End of over 13 ( 6 Runs )MI 116/3 Krunal Pandya* 6(10)Suryakumar Yadav 19(14) 12.6Yuzvendra Chahal to Krunal Pandya. no run, Shorter on middle and off, Krunal looks to defend but gets a leading edge and the ball lobs away to the off side. 12.5Yuzvendra Chahal to Krunal Pandya. no run, Flighted on middle, Krunal comes down the track and blocks it. 12.4Yuzvendra Chahal to Suryakumar Yadav. 1 run, Tossed up on off, Suryakumar Yadav lofts it over the bowlers head. He does not time it well but times it enough to send it over the bowler's head for a single. 12.3Yuzvendra Chahal to Suryakumar Yadav. no run, Tossed up on middle and leg, Suryakumar Yadav looks to defend it but it goes towards backward point off the leading edge. 12.2Yuzvendra Chahal to Suryakumar Yadav. FOUR, FOUR! Excellently played. Suryakumar Yadav knows where exactly the fielder are. 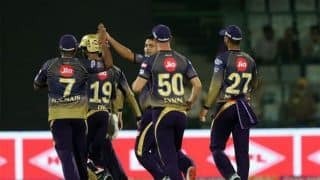 It is a tossed up ball on middle and off, Suryakumar Yadav gets on one knee and sweeps it behind square for a boundary. 12.1Yuzvendra Chahal to Krunal Pandya. 1 run, Floated on middle, Krunal plays it to deep mid-wicket and takes a single. End of over 12 ( 2 Runs )MI 110/3 Suryakumar Yadav* 14(11)Krunal Pandya 5(7) 11.6Moeen Ali to Suryakumar Yadav. no run, The batsman has played that off the front foot and into the ground. 11.5Moeen Ali to Krunal Pandya. 1 run, Short and outside off, placed behind point for a single. 11.4Moeen Ali to Krunal Pandya. no run, A bit of turn there. KP comes down the track again, looks to defend but the ball turns away and takes the leading edge. Does not carry to the bowler. 11.3Moeen Ali to Krunal Pandya. no run, Outside off, Pandya drives this down the ground but Moeen dives to his right and makes a terrific stop. 11.2Moeen Ali to Krunal Pandya. no run, Full and around off, Krunal thrusts his bat forward, gets a big stride and looks to defend but an inside edge is induced. Parthiv screams his lungs out for LBW. 11.1Moeen Ali to Suryakumar Yadav. 1 run, Landed outside off, Yadav dabs it late to short third man who has been kept very fine now. Just a single. End of over 11 ( 11 Runs )MI 108/3 Krunal Pandya* 4(3)Suryakumar Yadav 13(9) 10.6Yuzvendra Chahal to Krunal Pandya. FOUR, FOUR! On the leg side, Pandya plays the paddle, Siraj gives it a chase and tries to stop it with a dive. The ball is pulled back but then it rolls back into the ropes. 11 runs and a wicket from the over. 10.5Yuzvendra Chahal to Krunal Pandya. no run, Floated on middle and off, Krunal gets behind the line of the ball and blocks it. 10.4Yuzvendra Chahal to Krunal Pandya. no run, Flighted outside off, Krunal looks to defend but gets an inside edge onto his pad. Krunal Pandya has been sent in at number 5, replacing Kishan. Left-hander replaces left-hander. 3 wickets down for MI. Out batsman is Ishan Kishan 10.3Yuzvendra Chahal to Ishan Kishan. out, OUT! Chahal has the last laugh! Ishan Kishan overcooks his idea of coming down the track and attacking the spinner. Chahal shows his class and tosses it up outside off, Ishan Kishan once again comes down the track to hit but misses and Parthiv Patel behind the stumps does the rest. Ishan tries to get back in but he is way too short. The umpires go upstairs to check. Replays roll in and show everything was good and Kishan has to walk back. Probably a touch needless, given that he just hit a six on the previous ball. 100 runs for MI 10.2Yuzvendra Chahal to Ishan Kishan. SIX, SIX! Ishan just loves playing the spinners. He will attack them no matter how much it is turning. Floated on middle, Ishan Kishan comes down the track and lofts it over mid-wicket for a maximum. 10.1Yuzvendra Chahal to Suryakumar Yadav. 1 run, Tossed up on off, Suryakumar Yadav sweeps it away for a single. Yuzvendra Chahal is back into the attack. End of over 10 ( 10 Runs )MI 97/2 Ishan Kishan* 15(7)Suryakumar Yadav 12(8) 9.6Moeen Ali to Ishan Kishan. no run, Full and around off, watchfully defended to end the over. Bangalore were 70/2 at the same stage. 24 from the last 2 overs, excellent counter-attack from Mumbai after losing 2 in one over. 9.5Moeen Ali to Suryakumar Yadav. 1 run, Pushes this through point for a single. 9.4Moeen Ali to Suryakumar Yadav. no run, Around off, SKY looks to work it to the leg side but is squared up. The ball goes off the leading edge towards point. 9.3Moeen Ali to Suryakumar Yadav. SIX, SIX! Classic shot. Plenty of flight from Moeen and Surya is happy. Leans and lofts this from outside off, against the turn and all the way over sweeper cover! 9.2Moeen Ali to Suryakumar Yadav. 2 runs, Risky but effective. Outside off, spinning in a long way, Yadav waits for the ball to come in and then plays it with the turn through the vacant slip region for a couple. 9.1Moeen Ali to Ishan Kishan. 1 run, Full and outside off, tossed up slightly, flicked through mid on for a single. End of over 9 ( 14 Runs )MI 87/2 Suryakumar Yadav* 3(4)Ishan Kishan 14(5) 8.6Pawan Negi to Suryakumar Yadav. no run, Floated on middle, SKY blocks it to see off the over. 14 runs off the over. A good one for Mumbai. 8.5Pawan Negi to Ishan Kishan. 1 run, Shorter on off and middle, Kishan pulls it away for a single. Finally some respite for Negi. 8.4Pawan Negi to Ishan Kishan. SIX, SIX! Two in a row! Ishan Kishan is not backing away and has decided to take on the spinner. He comes down the track and lofts it over the mid-wicket region for another maximum. 8.3Pawan Negi to Ishan Kishan. SIX, SIX! It is turning too much so Kishan decides the best way to tackle the spinners is to go after it. He comes down the track and lofts it straight into the sightscreen for a maximum. 8.2Pawan Negi to Ishan Kishan. no run, This one has not just spun but also kept low after pitching. Tossed up outside off, Ishan Kishan looks to defend it but it goes between his bat and pad. 8.1Pawan Negi to Suryakumar Yadav. 1 run, Shorter on the pads, Suryakumar Yadav flicks it to square leg and takes a single. End of over 8 ( 3 Runs )MI 73/2 Suryakumar Yadav* 2(2)Ishan Kishan 1(1) 7.6Moeen Ali to Suryakumar Yadav. 1 run, The batsman has flicked the ball off his pads. One run added to the total. 3 runs and 2 wickets in that over. Will the game begin to turn now? 7.5Moeen Ali to Ishan Kishan. 1 run, Goes back and flicks it through square leg for a run. Ishan Kishan is the new man in. 7.4Moeen Ali to Quinton De Kock. out, OUT! LBW! Second wicket in the over and Moeen has got both the openers. This is the quicker one. The one which goes with the arm. Landed on middle, de Kock goes back to work it through the leg side, looking to play for the turn but the ball goes straight through. Beats the bat, hits him on the pads and umpire Erasmus raised his finger quickly. 7.3Moeen Ali to Quinton De Kock. no run, The batsman has defended it by getting right behind the line of the delivery. 7.2Moeen Ali to Suryakumar Yadav. 1 run, Outside off, turning in a long way, Yadav looks to flick but the ball goes off the inner half of the bat through square leg. A single taken. Suryakumar Yadav walks in at number 3, replacing his skipper. 7.1Moeen Ali to Rohit Sharma. out, OUT! Cleaned up! Gone right through. Moeen strikes to give the first break for Bangalore. Can they find any rhythm from this? Sharp, sharp turn again. Outside off, Rohit goes back to cut but the ball spins in a furlong and goes past the inside edge to hit the middle stump! Not a big knock from Rohit but this 70-run stand has kept Mumbai on top. 102 more needed from 77 balls. End of over 7 ( 3 Runs )MI 70/0 Rohit Sharma* 28(18)Quinton De Kock 40(24) 6.6Pawan Negi to Rohit Sharma. 1 run, Tossed up outside off, Sharma drives it to sweeper cover and keeps the strike. 6.5Pawan Negi to Rohit Sharma. no run, On the stumps, Sharma blocks it off his back foot. 6.4Pawan Negi to Quinton De Kock. 1 run, In the air but safe. Floated on middle and off, de Kock mistimes his sweep but it falls short of Chahal at fine leg. 6.3Pawan Negi to Quinton De Kock. no run, Slightly shorter outside off, de Kock looks to cut but it is way too close to the stump. He misses his cut. Parthiv behind the stumps does not collect it and the ball goes on to hit the stumps. Luckily for De Kock his back leg was stuck to the ground. 6.2Pawan Negi to Rohit Sharma. 1 run, On the pads, Rohit flicks it away to the on side for a single. 6.1Pawan Negi to Rohit Sharma. no run, Starts with a wonderful away spinner. It is slow on middle and off and turns miles. Rohit looks to defend it but it spins miles and he misses. Strategic Break - Mumbai well on top here. They are going over 11 rpo and have not lost a wicket yet. Bangalore need to get wickets here as it looks like this match is slipping away from them. 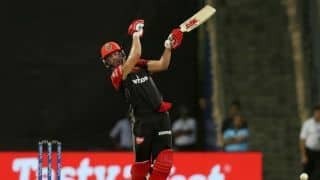 End of over 6 ( 13 Runs )MI 67/0 Rohit Sharma* 26(14)Quinton De Kock 39(22) 5.6Navdeep Saini to Rohit Sharma. 1 run, Good length ball on off, Rohit tucks it away towards mid-wicket for a single. He will keep the strike. 67/0 at the end of the Powerplay. This is their highest score in the Powerplay this season. 5.5Navdeep Saini to Quinton De Kock. 1 run, Now a single. Full on the pads, Quinton flicks it away for a single. 5.4Navdeep Saini to Quinton De Kock. SIX, SIX! Pulled and pulled away for a biggie. Good length delivery on middle and off, Quinton picks it early and smokes it over mid-wicket for a maximum. 5.3Navdeep Saini to Rohit Sharma. 1 run, Outside off, Rohit plays it towards point for a single. 5.2Navdeep Saini to Rohit Sharma. FOUR, FOUR! Full outside off, in the Powerplay over. It is an invitation for Sharma to show his classy cover drive. He does it and drives it through covers for a boundary. 5.1Navdeep Saini to Rohit Sharma. no run, Full length ball around off, Rohit hits it straight to mid on. Navdeep Saini returns. 1-0-11-0 so far. End of over 5 ( 6 Runs )MI 54/0 Quinton De Kock* 32(20)Rohit Sharma 20(10) 4.6Yuzvendra Chahal to Quinton De Kock. no run, Plays the reverse sweep now but finds short third man. 4.5Yuzvendra Chahal to Quinton De Kock. no run, Excellent stop by Marcus Stoinis. Outside off, QdK looks to run it down to third man but Stoinis at first slip dives to his left and makes a wonderful stop. 30 runs for Quinton De Kock 4.4Yuzvendra Chahal to Quinton De Kock. FOUR, FOUR! Poor bowling, superb shot. Full and down the leg side, de Kock gets down and sweeps it over the gap at short fine leg and square leg for a boundary! 4.3Yuzvendra Chahal to Quinton De Kock. no run, Pitched outside leg, Quinton looks to flick but misses and is hit on the pads. 4.2Yuzvendra Chahal to Quinton De Kock. no run, On middle and leg, flicked through square leg. 50 runs for MI 4.1Yuzvendra Chahal to Quinton De Kock. 2 runs, Full and around off, de Kock sweeps it towards square leg where Akshdeep Nath dives to his left but parries it behind. Two runs taken. 50-RUN STAND IS UP! Spin time. Yuzvendra Chahal into the attack. End of over 4 ( 12 Runs )MI 48/0 Rohit Sharma* 20(10)Quinton De Kock 26(14) 3.6Mohammed Siraj to Rohit Sharma. FOUR, FOUR! End of another expensive over for Bangalore. 12 runs off Siraj's first. Back of a length ball outside off, Rohit slaps it over covers for a boundary. 3.5Mohammed Siraj to Quinton De Kock. 1 run, On middle and leg, Quinton calmly flicks it away and rotates the strike. 3.4Mohammed Siraj to Rohit Sharma. 1 run, Length ball outside off, Rohit strokes it to point for a single. 3.3Mohammed Siraj to Rohit Sharma. no run, Back of a length ball on middle, Rohit defends it off his back foot. 3.2Mohammed Siraj to Rohit Sharma. SIX, SIX! It is raining sixes here in Mumbai and these two are going after the Bangalore attack. Back of a length ball outside off, Rohit slashes it over the point fence for a maximum. 3.1Mohammed Siraj to Rohit Sharma. no run, Good length ball on off, Rohit blocks it off his back foot. Mohammed Siraj has been brought on. End of over 3 ( 16 Runs )MI 36/0 Quinton De Kock* 25(13)Rohit Sharma 9(5) 2.6Umesh Yadav to Quinton De Kock. 2 runs, On the pads, de Kock flicks it wide of square leg for a couple. 16 from that over, Mumbai are off to a flier here. 2.5Umesh Yadav to Quinton De Kock. no run, Full on middle and leg, de Kock taps it back to the bowler. Umesh Yadav gathers the ball and has a shy at the keeper's end. He misses. Replays show had he hit the target, Quinton was a goner. 2.4Umesh Yadav to Quinton De Kock. SIX, SIX! This no luck and pure timing from de Kock. Back of a length ball on middle. De Kock picks the length early and whacks his pull over the fine leg fence for a mammoth six. 2.3Umesh Yadav to Quinton De Kock. FOUR, FOUR! Luck just not going Bangalore's way. Full length delivery outside off, de Kock looks to go over the on side but gets a thick outside edge over the slip fielder for a boundary. 2.2Umesh Yadav to Quinton De Kock. no run, Lucky, lucky escape for de Kock. Good length ball on middle and off, de Kock looks to block it. The ball goes towards the stumps after his defense but just about misses them. 2.1Umesh Yadav to Quinton De Kock. FOUR, FOUR! Glorious cover drive from de Kock. Deserved a boundary and got it as well. Full outside off, de Kock gets on his front foot and drives it for a boundary. End of over 2 ( 11 Runs )MI 20/0 Rohit Sharma* 9(5)Quinton De Kock 9(7) 1.6Navdeep Saini to Rohit Sharma. no run, Good ball, good leave and a good take behind the stumps from Parthiv Patel. Good length ball outside off, the ball swings in after pitching. Rohit shoulders arms to it. The ball does not stop swinging and Parthiv Patel behind the stumps dives to his left and gathers the ball. 1.5Navdeep Saini to Quinton De Kock. 1 run, Full on middle and leg, de Kock flicks it to fine leg and rotates the strike. 1.4Navdeep Saini to Rohit Sharma. 1 run, Good length ball on middle, Rohit nudges it down towards mid-wicket and gets a single. 1.3Navdeep Saini to Rohit Sharma. 2 runs, In the air...but safe. Once again a back of a length ball, Rohit pulls it but is early in his pull. Umesh Yadav at fine leg thinks that the ball will carry to him for a moment but it falls short of him as he runs to his left. Two runs taken. 1.2Navdeep Saini to Rohit Sharma. no run, Back of a length ball on the stumps, Rohit blocks it. 1.1Navdeep Saini to Rohit Sharma. SIX, SIX! First six of the innings and Rohit Sharma is off the mark with a maximum. Shorter ball from Saini, Rohit gets on his back foot and pulls it away over fine leg for a maximum. 1.1Navdeep Saini to Rohit Sharma. wide, 1 run, Wide! Saini starts just like Umesh Yadav. He bowls a good length ball down the leg side, Rohit looks to flick but misses. Parthiv goes up in appeal but the umpire signals it as wide. Navdeep Saini to bowl from the other end. End of over 1 ( 9 Runs )MI 9/0 Quinton De Kock* 8(6)Rohit Sharma 0(0) 0.6Umesh Yadav to Quinton De Kock. no run, Good length ball outside off, de Kock looks to play but misses. Good start for Mumbai. 9 runs off the first. 0.5Umesh Yadav to Quinton De Kock. FOUR, FOUR! Poor bowling this from Umesh. With no fielder in the fine leg region. Umesh bowls it short on the body, de Kock guides it on his way towards fine leg for a boundary. 0.4Umesh Yadav to Quinton De Kock. FOUR, FOUR! De Kock is off the mark and in some style. Full on middle, de Kock lofts it over the mid on fielder for a boundary. 0.3Umesh Yadav to Quinton De Kock. no run, Good length ball on off and middle, de Kock blocks it. 0.2Umesh Yadav to Quinton De Kock. no run, Inswinging ball full on middle and leg, de Kock looks to flick but gets hit on the pads. 0.1Umesh Yadav to Quinton De Kock. no run, Great ball. Good length ball on middle and off. Umesh gets bounce and a lot of inswing on this one. The ball goes between de Kock's bat and pad to the keeper. Parthiv asks the question but Umesh does not join. 0.1Umesh Yadav to Quinton De Kock. wide, 1 run, Wide! Not the start Umesh wanted. Bowls the first one down the leg side, Quinton looks to flick it but misses. We are back for the chase. Rohit Sharma and Quinton de Kock are the openers for Mumbai. Umesh Yadav to start the proceedings with the new ball for Bangalore.